Several years back I attempted a few large canvases. Usually I painted on wood or Masonite. An edition of Sound and Spirit on NPR on the French martyr, Joan of Arc, inspired one of these. I had already been thinking of a painting that I was doing drawings for, focusing on pre-renaissance images of Saint Joan but I had not had the spark yet which helps me settle on the direction to take when starting an involved figurative work. During the radio broadcast I had an intense emotional experience, which prompted me to dive into the work. Drawings came quickly and then the final painting, This image is of that painting. I need a better image of the painting but wanted to finally share this painting with more people. It remains covered up in my small work space at my home, awaiting an appropriate venue to present it. Often I work intuitively but the preparation in thought and feeling can be years as was the case for this one. I believe this was one of the last oil paintings I did before I switched back to acrylic. 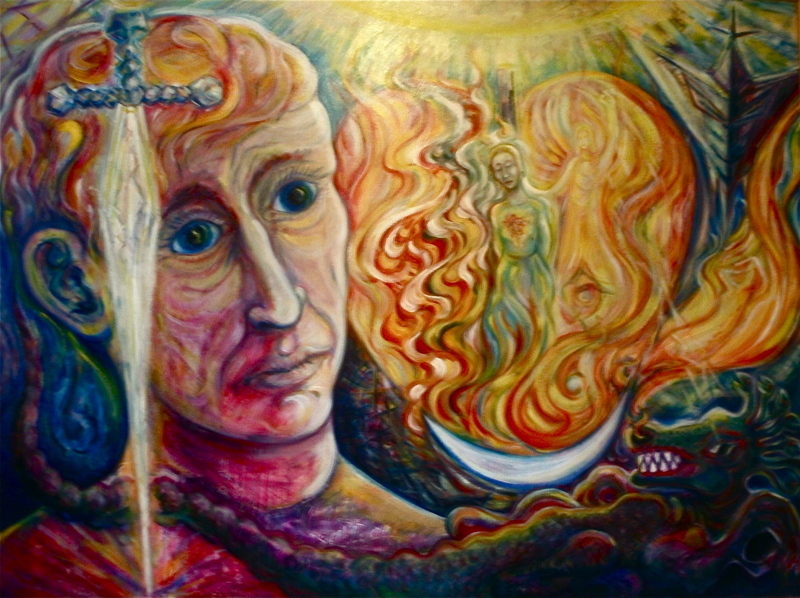 The image of Saint Joan in the flames is an assimilation of the pre-renaissance images I had been looking at and Those familiar with Steiner’s Group sculpture will notice several references within the painting. The moon below associates the Joan figure with the divine feminine. The cross made by the sword in the mind of the head contrasts with the Cross of the tail fin which is on the composite stealth bomber containing the visage of Ahriman. The dragon image remains ambiguous. It has 7 heads growing out of the one as a reflection of cosmic human development. The severed tail suggests the idea that negative forces are regenerative and must be combated in every age.